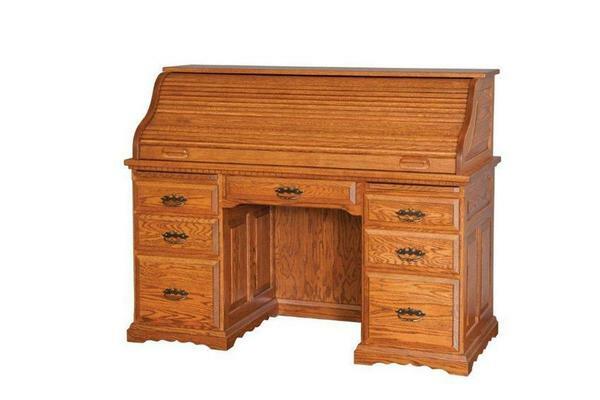 You won't find a more affordable roll top desk that has the beauty and quality of workmanship as this stunning solid wood Deluxe Roll Top Desk. The timeless design of this roll top desk is Amish handcrafted from solid wood and even comes with an interior light that turns on when the tambour is pulled up. Depth from Front Edge of Desk Top to Side Cubby's: 13"
Center Height from Desk Top to Bottom of Drawers: 8"
I will be using the desk for my own personal use. This is a quality piece of furniture that I hope will be passed down to the next generation. I would definitely recommend dutchcrafters to friends and relatives.